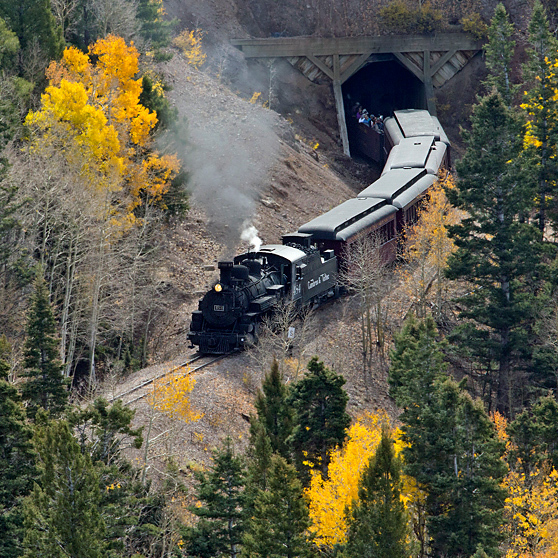 One of the best ways to enjoy the brilliant fall colors of the Rocky Mountains is by riding the Cumbres & Toltec Scenic Railroad (C&TSRR). 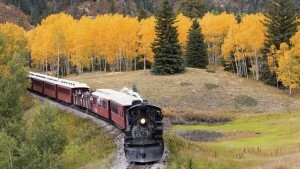 As the longest, highest and most authentic steam railroad in America, the C&TSRR goes where no roads go, twisting and turning for 64 miles through Rocky Mountain wilderness between Antonito, Colorado and Chama, New Mexico, crossing the state border 11 times. The train chugs along at a top speed of just 12 mph, steaming through tunnels and over high trestles. It travels through tens of thousands of colorful aspen trees. Along the way, passengers can see deer, elk, antelope, and even an occasional bear. All full day rides include a delicious hot lunch at scenic Osier Station. Once ridden by Wyatt Earp, Doc Holliday and most of the famous figures of the Old West, the Cumbres & Toltec was built in 1880 and today it is a moving National Historic Landmark – a “Williamsburg on Wheels,” that re-creates the magic of the glory era of steam railroading. It was judged by the readers of USA Today’s 10Best to be the best train ride in America. While the ride is spectacular at any time, it is especially gorgeous in the fall when the aspens put on their annual show. There are more than two million acres of aspen trees in Colorado and New Mexico — one billion trees that if placed together would cover Rhode Island and Delaware. Aspen trees in the Rocky Mountains grow at 6,500 to 10,500′ elevations. Although many factors make leaves turn color, as a general rule, the higher the elevation, the sooner the leaves turn gold. That means that over a period of time, you can often see a variety of shades of color on one mountainside, with deeper golds on top at 10,000 feet, blending to pale yellow in the 8,000-foot range. Since the Cumbres & Toltec runs from 6,800 feet to 10,015 feet at the top of Cumbres Pass, you can expect to see varying colors of fall aspens all along the route. Rocky Mountain aspen leaves don’t just turn color in the fall, they positively glow a bright luminescent yellow gold, almost as if they had their own light source. The leaves are small, delicate and tissue-thin with an aerodynamic shape that keeps them in perpetual motion. Even a slight breeze sends every leaf on the tree shimmering. Fall rides are extremely popular and do sell out, so book early to avoid disappointment!